Your Friendly Neighborhood Amoeba is not much on nostalgia. He is generally content to leave past events where he buried them, take such lessons as he could pry from them – or as they liberally dumped on him – and look forward to what comes next. These past events are all too likely, as it is, to exhume themselves, dust themselves off (sorta), creep undetected to YFNA’s bedside (regardless of the continents and oceans and decades that needed to be crossed), and yell BOOGABOOGA! in his ear at 3 AM. They don’t need any help from “Age Test” Facebook memes. Or anything else. Thank you kindly. James Thurber, mid-20th century writer and cartoonist who grew up in Columbus, Ohio but spent most of his career in New York City, once wrote, “I am having a fine time now and wish Columbus were here”. This is pretty much how YFNA feels about his time now, in Hawai‘i, and a careful selection of past places and things (obviously not the ones going BOOGABOOGA in the middle of the night). But it came to pass, about a month ago as this is written, that YFNA left Tutu Pele‘s somewhat precarious protection and ventured forward into his past at the University of Washington’s Friday Harbor Laboratories. FHL, as its veterans know it. Which counts for a rather surprisingly large lot of people. YFNA remembers chalk. In the dark ages of education, before Photoshop and Powerpoint and Skype and flipped classrooms, it was what was for lecture. Your professor wrote it on the chalkboard (there were no trigger warnings for nails, or non-chalk objects in the chalk, screeching on the board), and then pointed to the lab buildings inches from the living ocean, and said “Go. See for yourselves. I am coming too, I will get you started.” And we went. And later, it was YFNA who wrote, and then pointed and said “Go”. And the students went. To see for themselves what had been written in chalk on the boards. And then described for themselves and others. In chalk on the boards. Including the boards in the dining hall that YFNA saw on this trip. The same ones that had been in that dining hall when YFNA first lined up for dinner. In the summer of 1975. The same ones that he had himself scrawled notes, and instructions, and crude pictures, upon. 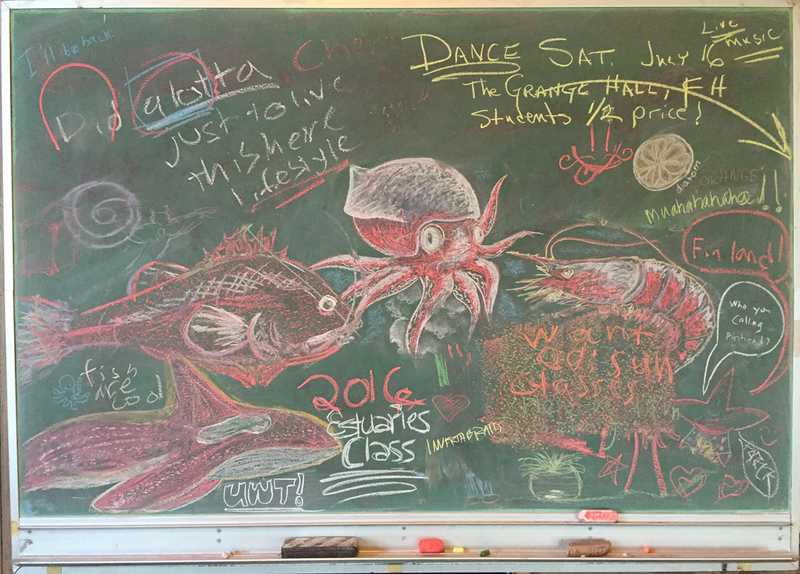 Clearly, at least some of the students at FHL in 2016 still knew how to handle chalk, still could declare some level of independence from Apple and Google and Microsoft and GoPro and Pikachu. Still had some connection to a world that didn’t have to be virtual to be real. Perhaps, YFNA thought as he stepped into the puddlejumper plane that would start him on the road to his conference, and then back to Pele and his new Hawaiian life, some of these chalk wizards will get a gig with Pixar. This entry was posted in Amoeba's Lorica, personal thoughts and tagged Adam Summers, chalk art, chalkboards, Drew Harvell, Friday Harbor Laboratories, marine biology, sea of glass, university lectures. Bookmark the permalink.